Poach the shrimp, bay scallops and calamari in 3 gallons of simmering water for 2-3 minutes or until shrimp and scallops are opaque; drain. Submerge in an ice water bath to cool; drain. Cut shrimp into bite- sized pieces. 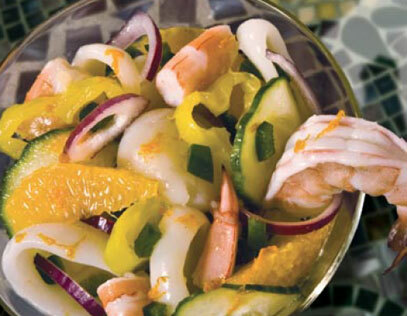 Combine seafood with onions, banana peppers, cucumbers, oranges, jalapeño pepper and orange, lemon and lime juices. Refrigerate, covered, for at least 1 hour. Add more heat and a splash of green with the addition of Bay Valley® Brand Pickled Jalapeño Pepper Rings.